A World War II military hero who founded the Mighty Eighth Air Force Museum in Pooler was remembered Tuesday for his dedication to memorializing his fellow airmen and his commitment to the U.S. Air Force. Retired Major General Lewis E. Lyle died Sunday at his home in Hot Springs, Arkansas. He was 92. "He had an incredible World War II record and a very unassuming and personable personality," said Bill Murdock, a volunteer at the museum. "The few times I saw him, he was walking around meeting everyone." Lyle piloted B-17 bombers in World War II, flying more combat missions than any other lead pilot. He was officially credited with 76 bombing missions. Upon his return, Lyle began thinking of ways to immortalize the more than 52,000 men and women of the then-U.S. Army Air Force who either lost their lives in the war or were listed as officially missing in action in the Big One, as well as the commitment of more than 350,000 members of the 8th Air Force. In 1983, he and other war veterans began planning a museum for that purpose. "The 8th Air Force was born at Hunter Army Airfield in 1942 and was officially activated on Bull Street in Savannah," said Brenda Elmgren, chief administrative officer for the Mighty Eighth. "So he felt this was the proper place for the museum since it was the home of the 8th." On May 14, 1996, the museum opened in Pooler, just west of Savannah. Lyle was deeply involved in the museum as a member of the executive board, and he was a donor for the nonprofit memorial museum. "He gave frequently and generously," Elmgren said. "He put his own money where his mouth is." Elmgren described Lyle as a great leader who was gentle and humble. She remembers how everyone in the room would be listening any time Lyle spoke. Although the museum is more than 700 miles east of Hot Springs, Lyle made frequent visits. And despite his age, he remained committed and passionate. "He always drove to Savannah, every time," Elmgren said. "I guess his flying days were over after World War II." Retired July 1, 1967. Died April 6, 2008. A native of Pine Bluff, Arkansas, Major General Lewis E. Lyle, who was commander of the 818th Strategic Aerospace Division, Lincoln Air Force Base, Nebraska, began his military career in 1938, when after graduation from college he was commissioned a second lieutenant in the Infantry Reserve. Full time active duty for the General began in December 1940. He served from then until May 1941 as an officer with an anti-tank company. His entry into flying came in May 1941 when he was selected for Aviation Cadets. Graduating in December 1941, the general was recommissioned and awarded his pilot wings. Assigned to the European Theater, he flew 69 combat missions as first pilot in a B-17. Promoted to full Colonel in January 1945, the general returned to the United States and served as base commander at McCook, Nebraska, until 1946 when he spent a year as a student of the Naval War College, Newport, R.I. in July 1947, he was assigned to the Evaluation Division of the Air University, Maxwell Air Force Base, Alaska. From that assignment, he moved to the 91st Strategic Reconnaissance Wing, Barksdale, Louisiana. While with the 91st he served, at various times, as maintenance control officer, operations officer, acting commander and deputy commander. When the wing moved to Lockbourne Air Force Base, Ohio in September 1951, the general made the move with the wing and retained his position as deputy commander until October 1952, when he was named Lockbourne base commander. In August 1953, he began a year's tour as a student at the Air War College. Upon graduation, he became chief of staff of the 5th Air Division. This was followed by assignment to Headquarters Strategic Air Command and a position as chief of plans in the Directorate of Plans and deputy director of plans for two years. 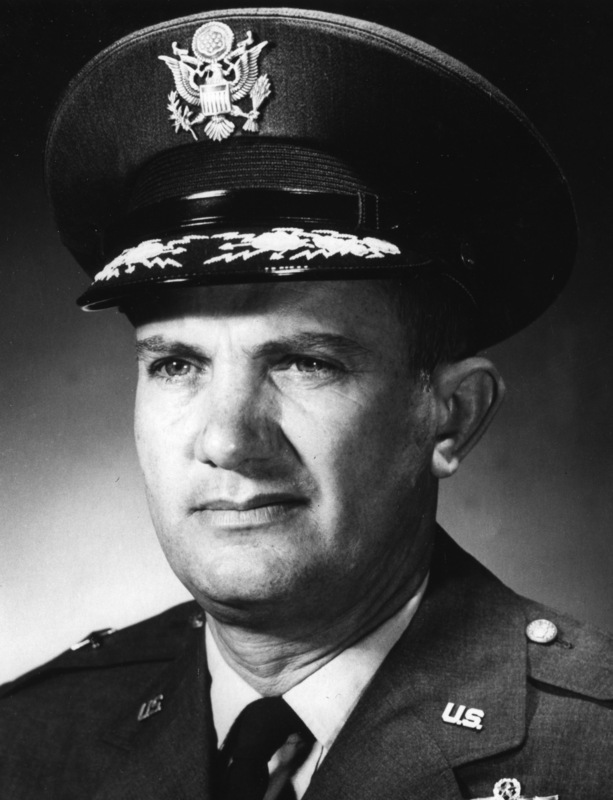 On July 1, 1958 he was named commander of the Barksdale-based 4th Air Division and. on Jan. 1, 1959 he became director of plans for Headquarters Second Air Force, a position he held until he was named Second Air Force chief of staff on Aug. 21, 1959. He became a Brigadier General on July 21, 1961. In his position as commander of the 818th Strategic Aerospace Division, General Lyle's realm of responsibility ran the gamut from pre-World War II transport aircraft to one of the most recent additions to SAC's fighting force, the Atlas Intercontinental Ballistic Missile. Under the General's command were the KC-135 tanker equipped 385th Strategic Aerospace Wing, the 307th medium bomb wing and 98th Strategic Aerospace Wing equipped with B-47 Stratojet bombers. The 549th and 551st Strategic Missile Squadrons, both of which use the Atlas missile and the 818th Combat Support Group, the host agency at Lincoln Air Force Base. A command pilot, the General had more than 6,500 hours flying time. Included in his decorations are the Distinguished Service Cross, Silver Star with two clusters, Legion of Merit, Distinguished Flying Cross with three clusters, Bronze Star, Air Medal with nine clusters, British Distinguished Flying Cross and the French Croix De Guerre, Air Force Longevity Service Award with four oak leaf clusters (Nov 23, 1956-Nov. 22, 1960, Air Force Regulation 900-10), European African Middle Eastern Campaign Medal (AFR 900-7). All these medals were presented except the last two. 510 combat hours on 69 combat missions, (B-17) Europe, from October 1942 to June 1945. The President of the United States takes pleasure in presenting the Distinguished Service Cross to Lewis E. Lyle, Lieutenant Colonel (Air Corps), U.S. Army Air Forces, for extraordinary heroism in connection with military operations against an armed enemy while serving as Pilot of a B-17 Heavy Bomber in the 360th Bombardment Squadron, 303d Bombardment Group (H), EIGHTH Air Force, while participating in bombing missions from 17 November 1942 through 15 June 1944, against enemy ground targets in the European Theater of Operations. On all occasions Lieutenant Colonel Lyle demonstrated exemplary and courageous leadership, employing skilful and effective counter measures against whatever fighter opposition he has encountered and bombing enemy installations with consistently excellent results. Colonel Lyle's heroic and fearless leadership and his continued determination to fulfill his assigned task in the face of all odds has reflected highest credit upon himself, the 8th Air Force, and the United States Army Air Forces. POOLER, GEORGIA - Today, the Mighty Eighth Air Force Museum held a special memorial service for Major General Lewis E. "Lew" Lyle. He was the founding father of the museum and a World War II hero. As a Mighty Eighth commander, he flew far more B-17 missions than anyone else. Major General Lyle passed away last month. "He was our warrior and our hero and our inspiration," said Brenda Elmgren, the museum's chief administrative officer. "We gathered here today to give the people here locally an opportunity to memorialize and remember this great man." Lyle was 91-years-old. He's going to be buried June 5, 2008, at Arlington National Cemetery with full military honors.